US, 1986, 88 minutes, Colour. Charles Bronson, Jill Ireland, Stephen Elliot, Michael Ansara. 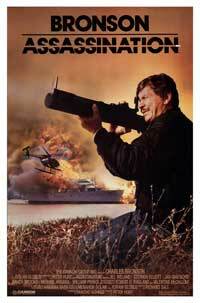 Assassination is a Charles Bronson vehicle, one of his last as a star performer. He was regularly directed during the late '70s and during the '80s by British director Jay Lee Thompson as well as Michael Winner, especially for the Death Wish films. In 1980 he had been directed by action director, Peter Hunt, for Death Hunt. This is minor Charles Bronson. He is a Secret Service man. His commission is to look after the First Lady (called `One Mama'). The First Lady is played by Bronson's wife, Jill Ireland, who appeared with him in many films. Michael Ansara is the villainous senator behind the plans to upset the presidency and for the assassination of the First Lady. The film is fairly predictable in its style, focuses on Bronson and his tough manner (though at his age, he does not involve himself in so much action). Audiences who enjoy Bronson's films will like this one and its Washington and political settings. 1. Entertaining action story? The Secret Service, political intrigue, assassination attempts? Washington and the White House? 2. A Charles Bronson vehicle, his status over the decades, action adventure? His working with his wife? Their image? 3. The Washington settings, Wyoming? The stunts and special effects? The musical score? 4. The title, audience expectations, the focus on the First Lady, the Secret Service and protection, the political conspiracy behind the assassination attempt? 5. Bronson as Jay Killian, his work as Secret Service man? His relationship with his boss, Fitzroy? The job of guarding Mrs Craig? Their meeting, Inauguration Day, the argument about the open car? The motor cycle accident? Killian's suspicions? Suspecting Reno Bracken? Mrs Craig and her reaction to Killian, her going about and risking her life? The blowing up of the yacht? Killian and his work, his relationship with Charlie Chang? The encounter with Senator Bunson, his warning him to move off the case? The job of guarding the secretary? Mrs Craig disguising herself as her secretary? Her escaping? Travelling to Wyoming? Mrs Craig and the variety of disguises? Killian protecting her? The assassination attempts? Killian and his discovery of the truth about President Craig, the possible divorce, Bunson and his power intrigues? Killian and the confrontation with Bracken, Bracken's death? Bunson's death? Killian and the relationship with Mrs Craig, moving away from the Secret Service, Mrs Craig's father? 6. Mrs Craig, her exotic name, the First Lady, her relationship with the president-elect? Her arrogance, the encounter with Killian, the argument about the car, her disregarding the accident? Ignoring Killian's warnings, the destruction of the yacht? The assassination attempts, her disguising herself as her secretary? The escape to Wyoming? Her reliance on Killian, believing him? The background of her plan for divorce, Senator Bunson's intervention? Her survival - and the job for Killian? 7. President Craig, his ambitions, the influence of Bunson? His relationship with his wife, the surface, the potential divorce, his impotence, the damage to the presidency were there to be a divorce? 8. Senator Bunson, friendship with the president, power behind the throne, influence, antagonism towards Killian, warning him off? His hiring the killer? His own death? 9. Bracken, terrorist, assassin, the accidents, the attempts to kill Mrs Craig, his own death? 10. The background of the Secret Service, Fitzroy and his authority, jobs, protocol, protecting the president, the tradition? The dangers for the Secret Service? 11. Popular action entertainment? Plausible? Charles Bronson thriller?